Greencore Group plc manufactures convenience foods throughout the UK, Europe and the USA and there are 15 sites nationwide. Metal spray coating on site at Greencore, Woking took place recently as the extensive premises was undergoing general maintenance. Vanda Coatings were asked to recoat the underneath of an interior walkway that was part of the staircase system within a large hall. This was in the head office section that was situated away from the main block of the food production factory. 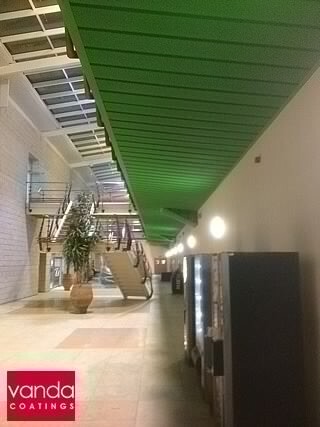 The walkway was originally brown as can be seen from the photos at the bottom and the client stipulated a green effect shown on the right and also at the bottom. As parts of the whole site were being refurbished, there were other trades nearby, but no one else was working directly on the walkway. In fact, Vanda Coatings were brought in specially to carry out this re-spray. When working on any project one of our aims is to cause the least amount of disruption possible which is why we almost always work outside of normal opening hours. The factory carrying out food production continued to operate as the spraying was far enough away to have no effect on manufacturing, but we still sprayed later in the day after 6pm when most of the office staff had gone home. The original brown coating on the aluminium metal pan strips was in good condition which always saves preparation time. It was just dusty from the air conditioning units, so needed cleaning before any coats of paint could be applied. Our team blew the dust away using an air hose and made sure the surfaces were clean and ready for spraying. Further preparation involved covering large expanses with plastic sheeting, brown paper and tape as can be seen in the photos shown at the bottom. The walls around the walkway were covered up. Then our team dropped a sheeted plastic curtain over the bannister rails to keep all the dusting and spraying enclosed within this tent which protected the main hallway. When smaller metal items are being recoated, our Vanda teams abrade surfaces, so that the top coat adheres to the substrate effectively. With larger areas of aluminium, sanding down would be far too time consuming, so after cleaning the substrate down a specialist top coat is used with a built in primer. In this case, the green water based paint was applied using an airless paint spraying system after all the preparation had been completed. The airless technique is particularly efficient when it comes to coating large surface areas and was the perfect choice for metal spray coating on site at Greencore in Woking.